Stylish and built to last, this Eurosmart Cosmopolitan kitchen tap is cleverly designed for anyone who wants to install a tap in front of a window. Whenever you want to air the room it simply lifts out of its base so you can swing the window open. As a single-lever tap it’s easy to operate and it has a cutting edge GROHE SilkMove ceramic cartridge so you can control water temperature and flow with smooth and effortless precision. The scratch resistant chrome coating is easy to clean, too, and has a sparkle that will last for years. 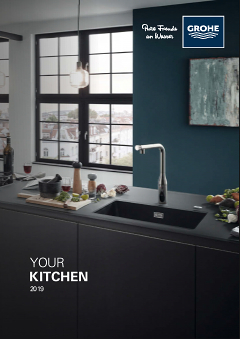 The Eurosmart Cosmopolitan kitchen tap – blending beautiful contemporary style and premium quality for your kitchen convenience.